Contemporary Artist Jack Armstrong is on the verge of a media explosion. Register your interest below to receive one of only 100 First Edition Souvenir magazine/ brochures. The strength of an artist. The power of a market. Jack Armstrong started his professional career as an artist in 1979 when he arrived in New York to profit from the vibrant art scene at the time. He benefited from Andy Warhol’s endorsement who dubbed him the “Last Wizard”, a nickname still used today. By the 1990s he developed his own style: Cosmic Extensionalism. He made a choice to buy back all early works and destroy them. This limited his production to 100 artworks. He has now stopped producing paintings since 2010, after the completion of his 100th artwork. He now focuses on the production of artworks on different media. Thanks to upper quality and strong impact on American art history, Jacks works find themselves within important private collections. With artworks pricing in the high-end range of the art market and the existence of a sustained demand for artworks. 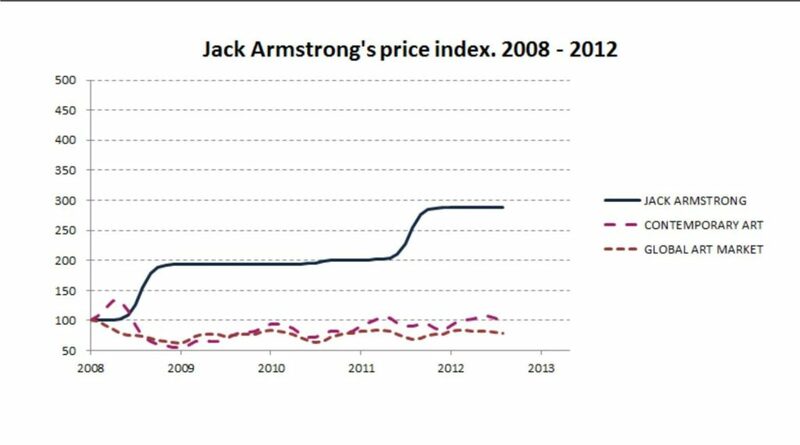 Price indices: Jack Armstrong, Contemporary Art Market and Global Art Market since 2008. Sources: BajaArtists.com, artnet A.G. (raw data). Methodology: Hedonic price index. 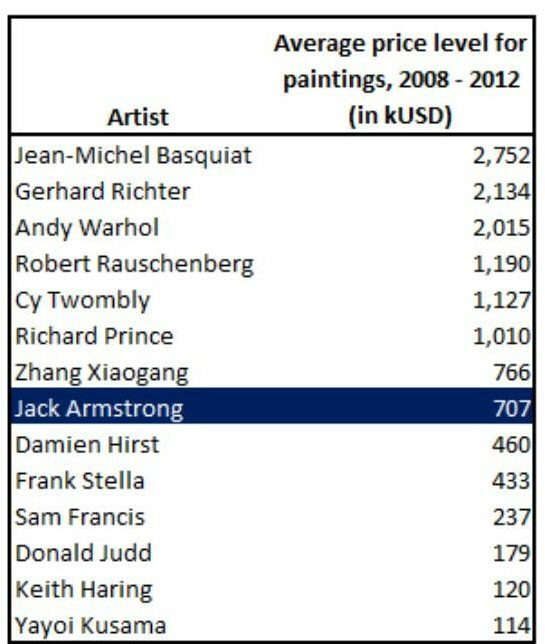 Jack Armstrong’s main investor strength lies in his drastic policy regarding the microstructure of the art market. His notorious rebellious attitude towards art establishment has been lasting for decades and has nourished an interesting alternative to classical dealership: he has fully vertically integrated the supply chain of his own market. As a major consequence for the art investor, there is no dealers’ margin on his sales, hence a frictionless economic environment, usually only devoted to traditional financial assets. As a side effect to his aversion for dealers, his natural and sincere commitment to the purity of the relationship with his collectors is highly attractive to consumers. By offering this particular value-proposal to the art market, he has managed to position himself as a safe-haven for high quality contemporary American art. This business model is, to our knowledge, unique in its own right for high-end contemporary art that is usually distorted by pushy dealers. Armstrong published three art books containing all of his 100 paintings, from 2009 to 2010. Critics and collectors have raved about his new style of intense texture, color and light, saying it begins where Pollock and de Kooning stopped. His bold signature, “Jack,” alongside other cosmic messages written in the paint, lets the world appreciate his artistic breakthrough – something unseen and mystical. As Andy Warhol once told of him, “It is more alchemy than art.” Deservingly, and much sought after, his paintings are priced from 7 hundred & fifty thousand to 6 million dollars each.